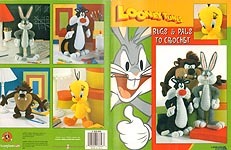 Looney Tunes Bugs & Pals to Crochet, designed by Caroline Christmas, Leisure Arts, 2004. Characters to crochet in worsted weight yarn include: Tweety, Sylvester, Taz (Tasmanian Devil), and Bugs Bunny. Excellent condition. 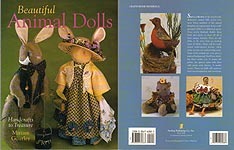 Beautiful Animal Dolls: Handcrafts to Treasure, designed by Miriam Gourley, Sterling Publishing, 2001. Designs to SEW with painted features include: Mephisto the Lion, Abijah Montgomery III the Rhino, Miss Anne the Elephant, Miss Ruth the Giraffe, Frogette, Red Hen & Cocky Le Doodle, Fairy Goose- Mother, The Robin's Nest, Jonah's Whale, Old Felt Bunny, Nanna Bunny, Mikey Rabbit, Renaissance Teddy Bear, King Tinton Bear, Queen Mindestronie Bear, Nitworth the Jester Bear. Excellent condition. Annie's Attic Raining Cats & Dogs, designed by Marianne Bruneau, Annie's Attic, 2007. 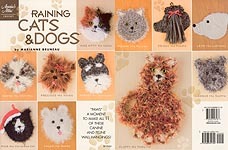 Crochet in bulky and worsted weight yarn, these 11 wall hangings include: Calico Kitty, Shih-Tzu, Yorkie, Schnauzer, Christmas Cat, Westie, Persian Cat, Poodle, Labrador Retriever, Scottie, and Tabby Cat faces. VERY difficult to find. Feels like book has never been opened BUT there is serious cover wear and an approx. 1/2" "wet" stain about halfway up the outside edges of ALL pages. My guess is, a cup of coffee was spilled on the book. Other than the stains in the margins mentioned above, pages are in excellent condition. 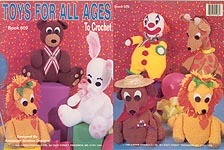 Toys For All Ages To Crochet, designed by Adele Mogavero of Alexander- Stratton Designs, Kappie Originals Ltd., 1993. Designs in worsted weight yarn include: Teddy Bear, Clown, Giraffe, Lion, Bunny, and Puppy. Very good condition. 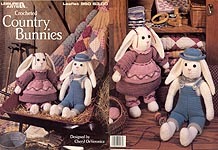 Crocheted Country Bunnies, designed by Cheryl DeVeronica, Leisure Arts, 1990. Crochted in sport weight yarn, boy and girl bunnies are 17" tall. Very good condition. 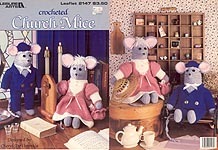 Crocheted Church Mice, designed by Cheryl DeVeronica, Leisure Arts, 1991. 15" tall Boy and Girl Mice in their Sunday Best, made with sport weight yarn. Excellent condition. 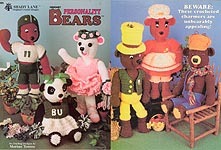 Personality Bears, designed by Marian Tomsu, Shady Lane, 1995. 6 designs in worsted weight yarn, measuring from 14" - 20" finished sizes. Very good condition. 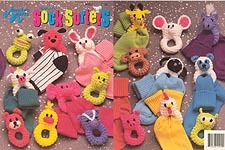 Crochet Sock Sorters, designed by Cynthia Harris, Annie's Attic, 1991. Cuddly animal rings made with worsted weight yanr: Bunny, Kitty, Puppy, Teddy Bear, Mouse, Frog,Pig, Lamb, Cow, Pony, Hen, Duck, Monkey, Elephant, Owl, Panda, Giraffe, and Skunk. Very good condition. 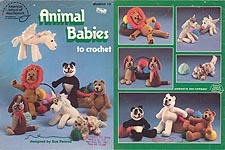 Animal Babies to Crochet, designed by Sue Penrod, American School of Needlework, 1982. Designs include: Unicorn, Pegasis, Panda, Snow Bear, Lion, and Basset Pups. Some cover & page wear, store stamp on cover and one inside page, age-yellowing. 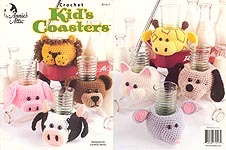 Crochet Kids' Coasters, designed by Cynthia Harris, Annie's Attic, 1999. 8 cute animal heads in worsted weight yarn to hold a soda pop can, bottle, or large glass, include: Lion, Bear, Pig, Cow, Giraffe, Puppy, Mouse, and Kitten. New. 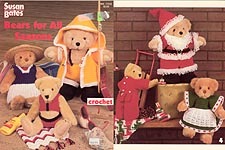 Crochet Pairs of Bears, designed by Jan Hatvield, American School of Needlework, 1993. 6 pairs of 7-1/2" tall bears celebrate Christmas, Easter, Thanksgiving, St. Pat's Day, and Birthdays, with a set for Bedtime wear. Excellent condition. 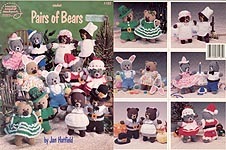 Bears for All Seasons, Susan Bates, Inc., 1989. 14 outfits for Spring, Summer, Fall, and Winter, each with instructions for 13", 15", and 17" tall bears. Designs include: Scholar, Letterman, Schoolgirl, Fisherman, Tourist, Bathing Beauty, Blanket, Jogger, Ballerina, Coach, Santa, Mrs. Santa, Jammy Bear (w/ drop seat), and Afghan/ Stocking. Excellent condition. 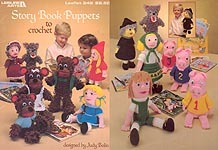 Story Book Puppets To Crochet, designed by Judy Bolin, Leisure Arts, 1982. Designs in worsted weight yarn include: Hansel, Gretel, & Witch; Three Bears & Goldilocks; Red Riding Hood, Grandmother, & Wolf; and the Three Little Pigs. Excellent condition. 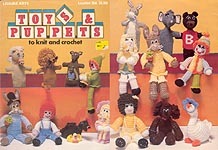 Toys & Puppets to Knit and Crochet, designed by Sue Penrod, Leisure Arts, 1978. Designs in worsted weight yarn include: CROCHET: Cocker Spaniel, Boy & Girl Rabbit, Boy & Girl clown, Goose, Hen w/ Chick, and four dolls; and KNIT: Lion, Black Bear, Rabbit, Horse, Elephant, and Kangaroo w/ Baby Puppets. Overall good condition. 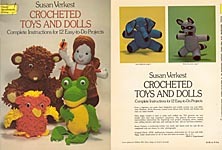 Crocheted Toys and Dolls, by Susan Verkest, Dover Needlework Series, 1978. "Complete Instructions for 12 Easy-to-Do Projects": Joe, Wendy, & Robin Dolls; Mark Mouse, Lucky Lamb, Oliver Owl, Rocky Octopus, Laurie Lion, Fred'rik Frog, BIlly Bear, Amy Elephant, and Ricky Racoon. Excellent condition; may have tape on back cover (not torn, just pieces of tape!) or ssmell slightly of "old vinyl." Coats & Clark Book No. 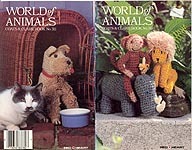 311: World of Animals, Coats & Clark, 1985. Designs in worsted weight yarn include: Rino, Hippo, Eland, Elephant, Unicorn, Alligator, Lion, Monkey, and Schnauzer. Digest- size booklet new, but mar on cover from price tag removal. 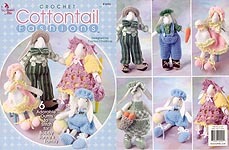 Crochet Cottontail Fashions, designed by Carolyn Christmas, Annie's Attic, 2004. 6 outfits to stitch for Bobby Bunny's Family (fits 11" and 14" muslin bunnys) in sports weight yarn. Like new. 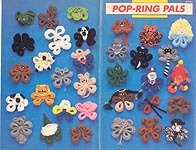 Annie's Attic Pop-Ring Pals, designed by Nellen Mentch, Annie's Attic, 1990. Digest size booklet with instructions for more than 30 designs crocheted with worsted weight yarn on a plastic ring cut from 6-pack beverage holders: Football Player, Teddy Bear, Cowboy, Indian, Princess, Clown, Band Player, Knight, Dragon/ Dinosaur, Gnome, Frog, Dragonfly, Spider, Pit, Turtle, Lamg, Raccoon, Squirrel, Bunny, Skunk, Lion, Monkey, Zebra, Tiger, Beaver, Elephant, Beagle, Gingerbread Boy, Panda, Kitty. School Mascot, Donkey, Mouse. May have label on cover, pages age- yellowed, but otherwise very good condition. 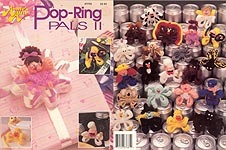 Annie's Attic Pop-Ring Pals II, designed by Cynthia Harris, Annie's Attic, 1991. Full size booklet with instructions for designs crocheted with worsted weight yarn on a plastic ring cut from 6-pack beverage holders. Artist, Angel, Ballerina, Bee, Baby, Duck, Bat, Chef, Farmer, Chicken, Cow, Koala, Policeman, Pony, Owl, Penguin, Octopus, Rhino, Turkey, Moose, Unicorn, and Witch. Excellent condition. 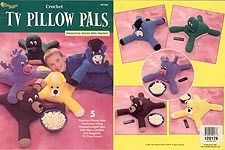 Crochet TV Pillow Pals, designed by Sandra Miller Maxfield, The Needlecraft Shop, 1999. 5 plump pets crocheted using worsted weight yarn measure 12" x 16" not including legs: Bear, Dragon, Horse, Kitty, and Frog. Excellent condition. 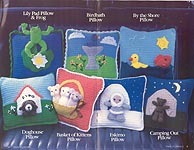 Annie's Attic Travel Pillow Pals, designed by Michele Wilcox, Annie's Attic, 1988. Original digest version with instructions for pillow and matching toy: Frog & Lily Pad, Doghouse with stuffed pup, Basket of Kittens w/ 3 kitten toys, Eskimo Pillow w/ Eskimo doll, Birdbath Pillow w/ stuffed bird, By the Shore Pillow w/ duck and fish, and Camping Out Pillow with Bear. Mint condition. 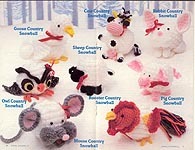 Annie's Attic Animal Snowballs, designed by Debora Gardner, Annie's Attic, 1987. Miniature animals with snowball bodies are crocheted in worsted weight yarn and measure from 2-1/2" - 4" tall. Includes: Goose, Owl, Mouse, Rooster, Sheep, Cow, Rabbit, Pig, and Rooster. Mint condition. 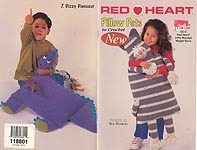 Red Heart Pillow Pets to Crochet, designed by Sue Penrod, Coats & Clark, 1999. Crafty Cat, Chatty Chick, Timid Turtle, Lickety Lion, Bingo Bear, Pinky Pig, and Dizzy Dinosaur crocheted in worsted weight yarn. Cover wear, looks like child scribbled on cover and inside page with pen; several tiny holes punched all the way through at bottom -- possibly with the point of that same pen. One pattern has worn pages and some pencil marks to keep track of rows -- other pages surprisingly clean. All patterns intact and readable. 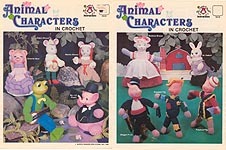 Animal Characters in Crochet, Harold Mangelsen & Sons, Inc., 1983. Crochet Bear, Robin & Marian Mouse, Elephant, Frog, 3 pigs, Rabbit, or Mama Mouse in worsted weight yarn to use with plastic animal heads. Pages yellowed, but otherwise in very good condition. 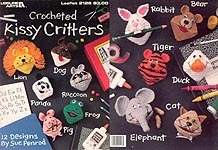 Crocheted Kissy Critters, designed by Sue Penrod, Leisure Arts, 1991. Crocheted in worsted weight yarn over a plastic canvas frame, designs include Lion, Dog, Raccoon, Frog, Panda, Pig, Rabbit, Bear, Tiger, Duck, Elephant, and Cat. Toys will open their mouths and can hold candy, etc. Entire leaflet rippled as if a damp towel had been laid on it -- center staples slightly rusted. Otherwise very good condition, though may smell slightly of cigarette smoke. 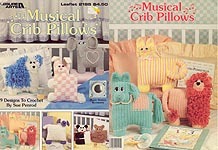 Musical Crib Pillows, designed by Sue Penrod, Leisure Arts, 1992. 9 designs in worsted weight yarn include: Teddy Bear, Elephant, Lamb, Panda, Lion, Shaggy Puppy, Bunny, Horse, and Cat. Some page yellowing and cover wear, but otherwise in very good condition. 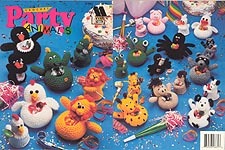 Crochet Party Animals, designed by Cynthia Harris, Annie's Attic, 1992. Worked with worsted weight yarn, these animals come in two sizes (3-1/2" - 4-1/2" tall) to hold surprises either in their tummies or in their arms, and include: Chicken, Dinosaur, Duck,Frog, Giraffe, Horse, Lion, Penguin, Pig, Puppy, Racoon, and Spider. Excellent condition, though may smell like cigarette smoke. 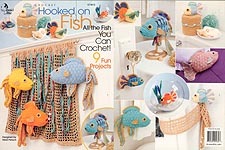 Hooked on Fish, designed by Heidi Petach, Annie's Attic, 2003. 9 fun projects in a variety of sizes, including pillow, tissue roll cover, ornament, toys, Pet Fish in a Bowl, curtain tieback, wall hanging, Fish on a Stick, and Fish on a Line. VERY hard to find. Some cover wear / creasing, but pages are like new. Cuddle Buddies designed by Sheila Leslie, Annie's Attic, 2005. 8 adorable animals crocheted in worsted weight yarn: Frog, Pig, Elephant, Cow, Monkey, Bear, Bunny, and Duck. Cover wear (bending & rumpling, as if carried in a bag with "works in progress"), some pages wavy at bottom as if something damp had been set on them. 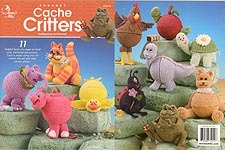 Crochet Cache Critters, designed by Sue Penrod, Annie's Attic. Eleven animal friends eager to hold your cherished possessions, and made with size 10 cotton thread and clear plastic globes. Includes: Duck, Pig, Frog, Apple, Kitty Cat, Lady Bug, Rooster, Elephant, Teddy Bear, Turtle, and Dinosaur. Like new. 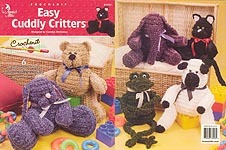 Easy Cuddly Critters,designed by Carolyn Christmas, Annie's Attic, 2002. 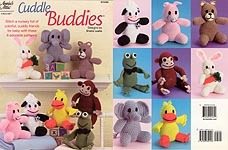 Six soft & cuddly friends made with bulky chenille and worsted weight yarns in "Crochenit." Includes: Bartholomew Bear, Humphrey Elephant, Bettina Bunny, Frederick Frog, Lillian Lamb, and Katerina Kitty. Used -- cover creased and scuffed, but pages like new. Faint smell of cigarette smoke. 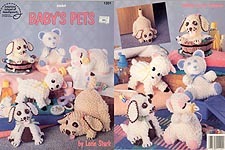 Crochet Baby's Pets, Designed by Lorie Stark, American School of Needlework, 1994. Six adorable designs made with worsted and sports weight yarn and embroidery floss: Puppy, Bathtime Doggie, Doggie Doorstop, Li'l Bear, Sleepy Bear, and Li'l Lamb. Like new. Herrschners Petting Zoo, Herrschners, 1999. 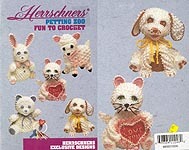 Rare digest-sized booklet containing five exclusive designs for adorable pets made with baby yarn and embroidery floss: Bear, Lamb, Bunny, Puppy, and Kitty. New.